There is something mystical about standing at the edge of the Kilauea Caldera, watching wisps of smoke filter up into the air and catching glimpses of red-hot lava as it breaches the blackness that covers it. Nothing brings you closer to the power of the Goddess Pele and the majesty of a live volcano. If you vacation on the Big Island of Hawai’i, be sure to take a trip to Hawai’i Volcanoes National Park to feel the energy of the volcano for yourself and tour a rainforest that looks like something out of time – if Madame Pele permits. Pele reminds visitors to Volcanoes National Park to be wary in a variety of ways, as we had occasion to discover when we visited the park in March of 2008. Two days before we were to go on our tour of Volcanoes National Park, there was an explosion in Halema`uma`u crater on Kilauea Volcano. As a result, sections of the park were closed to visitors. We were fortunate that we were still able to access other areas of the park, including parts of Crater Rim Drive. But by the time we returned home to Ontario, Canada, there had been more volcanic activity and the whole park was temporarily closed to visitors. One of the risks of which to be aware is the risk of exposure to toxic sulfur dioxide (SO2), which spews from the volcano. It is important to check in with the park’s Visitor’s Center to verify where the safe viewing areas are so that you don’t go into any area that is high risk. The U.S. Department of the Interior, National Park Service provides information on SO2 conditions in the park, so it is a good idea to check their page prior to visiting the park to see where there might be problem areas. A well-known story says that to take lava rock from the Island of Hawai’i is to incur the wrath of the Goddess Pele. If you ask tour guides and locals where the story originated, you get varying responses, the most common one being that it was started by park rangers at Volcanoes National Park, who wanted to discourage people from removing lava rocks from the park. It is illegal to do so, but people were ignoring the legalities and removing rocks anyway, so, we were told, clever rangers started the story of the curse. Whether you believe in curses or not, the story goes on to say that many people who have removed rocks from the park have mailed them back, apologizing for the indiscretion and asking for Pele’s forgiveness, recounting tales of horrible repercussions from taking the rocks. 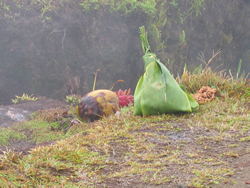 Many natives leave offerings to Pele along the rim of the crater to appease and honour her. You can see these offerings when you walk the trails in the park that rim the Kilauea Caldera. Kilauea Caldera is one of the most beautiful, powerful, and fascinating views in the park and you can access it from a few vantage points, one of the best and most convenient that I saw being behind Volcano House, located by the Visitor’s Center. Mist rolls in and out of the area, rain pours down (it’s rainforest country, so it gets very moist here) followed by bursting sunshine, and trails can crumble and disappear into the massive crater. But the rangers at the park and your tour guides will direct you to the areas that afford the safest and most profound views on the volcano. Volcano house has a restaurant and also allows guests to spend the night at the rim of the crater. While some find it unnerving to experience the intermittent earth-shaking seismic activity included in the price of admission, others say that it is an experience they are glad they didn’t let pass. Volcano House has been accepting overnight guests since its start as a grass shack in the mid-1800s. It is also possible to camp in the park and cabins are also available. Kilauea and Mauna Loa, the two active volcanoes that comprise Volcanoes National Park, are, according to various guides and guidebooks, currently two of the most active volcanoes on earth. It is possible to witness lava flowing into the ocean. Visitors may approach views of flowing lava in a variety of ways. Crater Rim Drive and Chain of Craters Road afford visitors spectacular views of the coast, including enormous plumes of steam where lava flows into the ocean. Along the way, there are a variety of interesting points where visitors can stop and explore such things as the Thurston Lava Tube (a cave that once ushered a river of lava along its course) or Devastation Trail (a point where hardened lava from a 1995 flow blocks the road). There are no hiking trails that lead directly to lava flows, but it is possible to get glimpses of the lava from land. Outside the park, Kalapana viewing area on Highway 130 may provide a view of lava flowing. Viewing conditions vary; so make sure you check with park rangers for the best options for that day. Visitors may also approach from the sea or by air. Helicopter or boat tours provide tourists with views of the lava flowing into the ocean. For the most spectacular and breathtaking views of the flowing lava, go after sunset, but be sure to take proper gear and water. Always check with park rangers or expert guides to be sure that you do not risk your health and safety. Keep abreast of any updates regarding park closures and volcanic activity by visiting the United States Geological Survey (USGS) Kilauea Status Update page, and if you are not with a tour group, then be sure to check in with the Visitor’s Center when arriving at the park. Dress for the weather (it can be cool and damp in the park) and be sure to wear comfortable and sturdy footwear. Carry water and a flashlight. If you are driving yourself rather than going with a tour, check your rental agreement for roads that you may have to avoid or risk voiding your insurance coverage. When we were there, Saddle Road was off limits to anyone using a rental car, according to the rental car agreements that we saw. While there have been improvements to this popular shortcut across the island since then, it is worth carefully reading your rental agreement to avoid making a costly error. A visit to Volcanoes National Park can be profound and mystical as well as fun and exciting, but your priority should always be your safety.